Coming up on August 1st, I will be mixing sound for a two band gig using an older Yamaha 03D Digital Mixer. The bassist in the feature band owns this console and a QSC powered speaker system to go along with it. The owner Dave told me that he will give me a crash course through the operations of the console before the show. He said most everything is already saved in memory as scenes making my job a little bit easier. Just wanted to ask which of your sound engineers out there either own or have mixed on the Yamaha 03D digital consoles. If you have, I would surely appreciate and tips or hints or shortcuts into the operation of the mixer. Personally, I am just starting to mix on the occasion digital mixer but, the majority of my gigs are still mixed on an analog console. 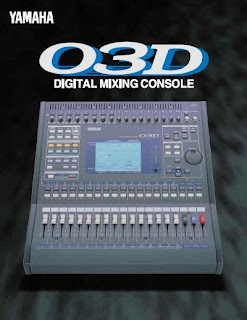 To help myself out, I downloaded the user manual for the Yamaha 03D console so that I read up on it and get a head start into mixing on that console. In case you are not familiar, here is picture of the Yamaha 03D from a product brochure that I downloaded from the Yamaha website.